Jeri Been Goodman graduated from Springlake-Earth High School and then attended Texas Tech University and earned a Bachelor of Science Degree in Exercise and Sports Science. Prior to coming here, she coached one year at Bovina and 10 years at Hale Center, 9 years at SE, and after 6 years away from coaching, she is once again the Lady Wolverine Basketball Coach. This will be her 17th year at SE ISD. 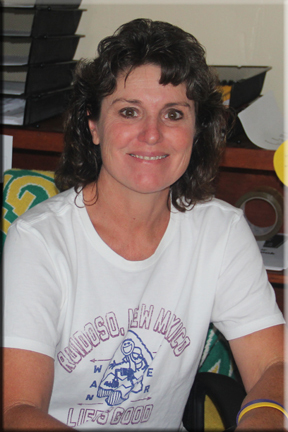 Jeri Paige is the District Testing Coordinator along with teaching and coaching duties. She is married to Jamie who is the manager of Wilbur-Ellis in Earth. They have a son, Trace (9th grade), and a daughter, Taytum(7th grade), and three dogs. The Goodmans also raise horses, cats, Charolais show heifers, chickens, peacocks, llamas, ducks & geese. Her family loves sports, riding horses, skiing, 4-wheelers, and going to Ruidoso for hiking, skiing & horse racing. Her major accomplishments are her family and taking the 2006 Lady Wolverines to the 1A State Basketball Finals.